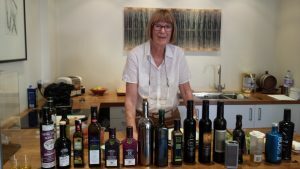 Karen Cryan is a real olive oil enthusiast “There’s nothing like a good Extra Virgin Olive Oil (EVOO) and I tasted sixteen of them at Judy Ridgway’s olive oil tasting class held in London last year”. 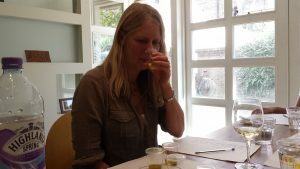 Here Karen describes her quest for olive oil knowledge and reviews one of my olive oil classes. “My zeal for olive oil began when I ended up living on an island in Greece for five years. Having just spent a year and a half in the fast-food dominated U.S., I dived into the simple olive oil, fish-based cuisine of Greece in the style of the Rome element of Eat Pray Love. When in 2012, taking a break from tasting wine, I wandered into the Sol & Agrifood section of VinItaly (an international wine competition/expo) in Verona and encountered thousands of producers with their olive oil, I was hooked. My quest to be an olive oil sommelier began with one of Ridgway’s classes over three years ago. Having completed a number of week-long olive oil tasting courses in Italy, including an International Master programme (www.oliveitaly.it ), I went back to London for a refresher. The setting was The Oil Merchant in Shepherd’s Bush, a small sunlight room with a long wooden table set up for tasting. It is a little bit of olive oil heaven with shelf after shelf laden down with olive oil from all over the world. Sixteen additional bottles were lined up on the counter ready for tasting, from Spain, Greece, Italy, Palestine, South Africa and Portugal. Due to a tube strike, only two others of the prospective group made the class which happily meant that the three of us that did attend got lots of extra attention. 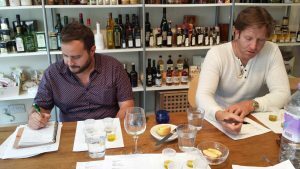 Childhood friends Sam Bullivant and Javier Carmona recently teamed up to form Spanish Luxury, an olive oil and food importation business, Javier having recently left his banking job in Spain to follow a lifetime interest in good food and oil. There is always an interesting mix of people on these courses. Some, like myself, simply have a passion for olive oil, others who attend range from those in the food and wine business to family of olive oil producers. Ridgway began the day by explaining that tasting olive oil reveals many things about the oil. First and foremost it tells if the oil has a defect and, if it has, then it is not extra virgin. Defects in an oil can be caused by numerous factors – olive oil fly, fermentation (the olives begin to ferment in warm weather conditions if not milled within twenty four hours of harvesting) and dirty milling equipment to name a few. Once it has been established that there is no defect in the oil, we moved on with the tasting. Here we took up our small plastic cup and cradled it in the palms of our hands in order to bring it to room temperature, agitating it to release its flavours. This done, we lifted the lid and quickly sniffed the oil a few times for our first impressions regarding scent and intensity. Typical terms that are used in describing extra virgin olive oil (both aroma and taste) are grass, apple, lemon, orange, avocado, herbs, banana, buttery, tomato, tomato leaves, artichoke, wet grass, rocket, nuts, liquorice, salad, tropical fruits, flowers and the more surprising tobacco leaves, hedge clippings and milk chocolate, to name but a few. This can be a subjective process, it is not that the oil necessarily always tastes or smells exactly like the description but more that it is ‘reminiscent’ of it. We each recorded our own initial impressions of the aroma of the oil, before moving on to the next step. To taste, the oil is sipped and rolled around inside the mouth, at the same time air is drawn in quickly at the both sides of the mouth, a process called Strippaggio. We then noted our taste impressions, discussing and comparing as we went along. The last two categories are bitterness and pepperiness. Some of the oils have a very bitter taste, so much so that you might scrunch up your face on tasting, others were mild to medium. Pepperiness describes the spiciness of the oil and can be felt as you swallow. Some of the oils are so peppery that they bring tears to your eyes and make you feel like your throat is on fire. We launched into coughing fits with some. In Italy, an oil can be described as a one cough, two cough etc oil. This pepperiness is a sign that the oil is high in polyphenols – one of the health giving properties of Evoo. Ridgway is an entertaining teacher, sprinkling her lessons with stories from her numerous trips around the world. She told of being at a tasting in Italy with a group of Italian men, where she accurately predicted the region each of the men were from. Amazed at what they believed was her ability to distinguish differences in their accents, she in fact had based her guess on the olive oil each had picked out as their favourite. Their preferred oils, from a large variety, were usually oils from the olive variety native to their region. To the question – is it worth spending money on a good extra virgin olive oil, the answer is a resounding YES. For many people, olive oil is to be bought as cheaply as possible. However, like wine, we get what we pay for. As Judy Ridgway pointed out, when we spend above ten euros on a bottle of wine it is gone in an evening. Spend money on a good extra virgin olive oil and you are buying not only a wonderful taste experience but the accruing health benefits. (Darina Allen – well known Irish food writer and chef – once said that if we don’t spend our money on quality food, we will spend it at the doctor). So join the revolution – after all, we all once thought that Blue Nun was a great little wine.